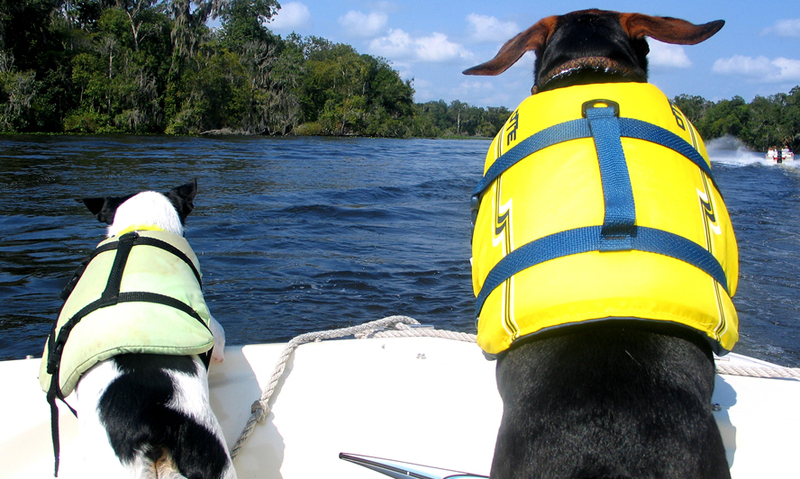 Just like when you take our kids out on the water, there are some basic tips you should know when boating with your pets to keep them safe. Here are some tips that I’ve gathered from my own experience and research I have done over the years. Hopefully this will get you pointed in the right direction. Getting comfortable with your boat. Like, I said not all dogs like the water, so you can take them shoreline fishing or even just down by the water for a walk. See how they respond to the water. If your dog is okay with the water, then test out the boat. 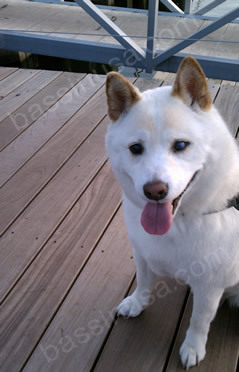 Let your dog get acclimated to your boat at the dock. Walking on a floating dock for the first time can be awkward for them. Think about how your dog will be able to get in and out of your boat at the doc. They may need some help. Dogs can wear life jackets too! I can’t stress this enough, ALL dogs can benefit from a life jacket. Even if your dog is a strong swimmer, it only takes a strong current or some choppy water to pull them under. Life jackets have handles so you can grab onto your dog and pull them out if need be. It’s a good idea to let your dog take a swim with their life jacket on in shallow water, so they can get used to it. Dog Overboard! Make sure you have a well thought out plan if your dog does fall overboard. Fill everyone in that will be with you so that no time is wasted. Also, make sure that you have identification and a phone number attached to your dog’s collar and life jacket, if possible. This is not a puppy marathon. It’s best to start off slow, so your do can get used to the boat’s movements. Keep an eye out for motion sickness, yes dogs can get it toot. If it persists speak to your Veterinarian. Safety First. All boats should be equipped with a first aid kit. Make sure you have some key first-aid items for your pet(s). Here’s a great list from the Humane Society for pets. How about a drink? Don’t forget to bring along some water and a bowl if your pet is going to be out in the sun for a while. You can even purchase a collapsible water bowl to keep tucked away on the boat. In addition, make sure to provide shade for them. Sun protection. Yes, even dogs can get a sunburn. I myself never realized it, but one day, I noticed my dog’s belly had gotten a little sunburnt while we were outside by the pool for the day. Look for ones without Zinc Oxide, it can be harmful to pets when licking it. Natural Dog Health Remedies has a list of different options with ratings. Boat surfaces can also get very hot, so watch out for those areas so your pet doesn’t burn their feet. Eye protection. Relax, I’m not talking about polarized Costa Del Mars. Bass boats travel at high speeds and it only takes one small particle to cause an eye irritation. In addition there’s twice the amount of sun rays reflecting off the water. Some doggie eyewear can cut down on the rays and protect them from your crazy hookset gone wild. Doogles offer some good options. When Nature calls… and I’m not talking about Ace Ventura. Once your pet has become a more experienced boater and can stay out with you for long periods of time, they will need to relieve themselves. Pets can be trained to go on the boat in designated areas. Bring wee-wee pads, carpet scraps (not my favorite) or artificial grass, which you can buy at a Home Depot. When out there with your beloved pet, know their location at all times and keep an eye out for any strange behavior. Most of all just use common sense. It’s just like taking your kids out on the boat. When in doubt about something, talk to your Veterinarian or other experienced boaters, they can usually help. I can assure you that you will have a great time out there with your furry friend. For those of you who regularly travel to new water to bass fish, or participate in tournaments that frequently bring you to unfamiliar impoundments, you are probably familiar with the overwhelming feeling of; “what do I do now?” Well, to offer some consolation, there are several steps you can take to combat this all to familiar problem, many of which are much easier than one might anticipate. First of all, quite possibly some of the most important steps you can take to prepare for new water, can be taken days or weeks in advance to physically traveling to your new destination. I consider these steps a form of “bassin’ reconnaissance”, that will, if done correctly, eliminate a whole lot of unproductive water. How many times do you have to fish in an area or new body of water and wish you could see the bottom? I bet if you could you wouldn’t be as afraid of fishing new bodies of water. The ability to read water is not a mystical power or a special talent it is just being observant to the lay of the land. When we are driving to our fishing destination do we pay attention to the surrounding land hills, bluffs, mountains, or swamps, we should. high performance machine there are a couple of safety pieces that you need in your boat just in case a situation occurs where you may need it. Life Jackets are the most important necessity to have in the boat. Whether it’s a foam jacket or a Automatic PFD, a life jacket could save your live if you get thrown out, if the boat sinks or for any reason where you have to get into the water. A life jacket will keep you head up and out of the water so you can work on trying to get to safety.